CARPE DIEM: Trend Toward Concierge Medicine + Obamacare With a Flat Supply of MDs = Pending Doc Shortage? Trend Toward Concierge Medicine + Obamacare With a Flat Supply of MDs = Pending Doc Shortage? "Concierge medicine is expanding as more doctors — and patients — tire of assembly-line primary care, opting for something more personal, and pricey. Concierge doctors care for a small number of patients who agree to pay an annual fee on top of insurance — $1,500 to $1,800 — in return for fast, unlimited access to the physician and to extra services like a comprehensive wellness plan. Patients also enjoy more leisurely appointments than the 15-minute visits that are now standard for most primary care doctors. The numbers are still very small — a survey commissioned by a congressional agency last year identified 756 concierge medical doctors in the United States, up from 146 in 2005. And Florida-based MDVIP, a company that helps physicians set up these practices, said it will add six new MDVIP doctors in the Boston area this year, increasing its physicians statewide to 16. But even a tiny number of doctors leaving traditional offices for boutique practices — out of thousands of primary care physicians — is enough to make some health care industry leaders nervous. They worry that more doctors will follow as insurers and government payers cut fees and hem in providers with regulations. And when even one doctor makes the switch, there are substantial side effects, leaving hundreds of patients to scramble for a new physician." 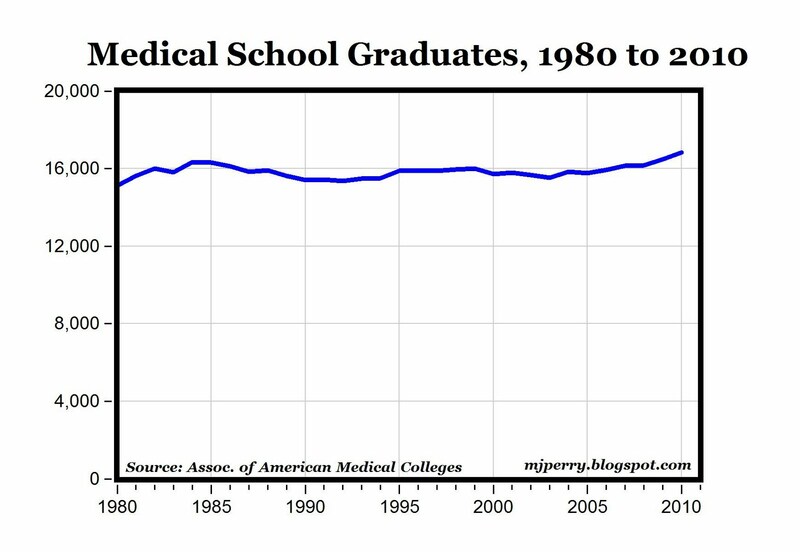 MP: The chart above of medical school graduates (AAMC data here) on an annual basis back to 1980 shows why the trend toward concierge medicine might present some future problems for the health care industry and Obamacare: the number of medical school graduates has been flat for 30 years, while the U.S. population has increased by 37.4% from 226.45 million in 1980 to 311.256 million today. As more physicians abandon high-volume, paperwork-intensive practices for low-volume concierge practices, and as more Americans are soon forced into Obamacare, where will the doctors come from? 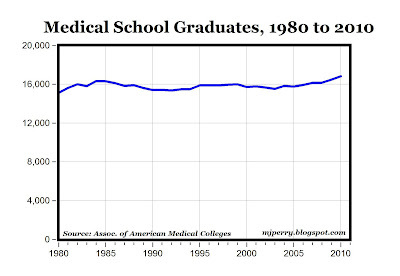 "As of 2007 the 120 US medical schools were conferring 15,730 MDs per year. That number has stayed remarkably consistent for nearly 30 years, with 14,900 MDs conferred in 1980 by 112 medical schools." "It is a serious and growing problem. For 12 or 18 months now, we have had sustained, absolute shortages of some of the most common intravenous drugs used in patient medicine." Those include intravenous Lasix, a diuretic commonly used to treat congestive heart failure, and Cisatracurium, a muscle relaxant used in surgery ... there are critical shortages of chemotherapy drugs and even morphine, according to the American Society of Clinical Oncology (ASCO). ... The American Society of Anesthesiologists (ASA) reports that its practitioners have been severely hampered by shortages of a variety of drugs used to sedate and immobilize patients undergoing surgery. Much of the problem seems to reside among generic medications, particularly sterile injectable drugs, such as Lasix and epinephrine, which is used to treat heart attacks and patients with allergic reactions. Sterile injectables are difficult and costly to make ... cost factors contribute to a decision by a manufacturer to stop making a medication, she said. "We often hear it was a business decision," Jensen said. In May, for instance, drugmaker Teva Pharmaceutical Industries Ltd., an Israeli firm with U.S. headquarters in North Wales, announced it would stop making propofol because the drug is hard to manufacture and produces little or no profit. Isn't the left always telling us that profit has no place in the health care industry? Some day those will literally be some leftist's last words. this doesn't take into account foreign docs. Do you suppose this ever increasing supply of lawyers will result in lower legal fees due to competition, or is it just that we have found additional ways to extract money from others? "As more physicians abandon high-volume, paperwork-intensive practices for low-volume concierge practices, and as more Americans are soon forced into Obamacare, where will the doctors come from?" The same place 25 percent of them already come from. Overseas! The third world will supply all that Obamacare will ever need in return for a wage American doctors would consider substandard. Remember they get non monetary compensation in the form of citizenship for themselves and their family. They will declare a shortage and open the country to third would doctors. Never mind that the shortage is caused by low pay. They do the same thing with the H-1B visa for computer programmers today even if qualified Americans are unemployed. The people who want Obamacare control the visa process. There is a hospital in Las Vegas, Nevada that spent a lot of effort to get classified as a rural hospital so that they could hire foreign doctors. Obamacare is not about the quality of medicine but the quantity. A third world doctor with a third world medical education may be the doctor you get under Obamacare. Ron, I'm sure there are many opportunities to take money away from one person and give it to another for a fee. Of course, others earn fees for creating real value, based on performance. Becoming a lawyer...include 4 years college degree, 3 years of law school and passing a bar examination...competition for admission to majority of law schools is intense. The United States is the country with more lawyers than any other in the world...from more than 200 law schools across the country. Lawyers in Washington shouldn't be micromanaging the economy, because they're not experienced in creating real value. Health care has become a luxury good, because of lawyers in Washington. Of course, the middle class can't afford a Cadillac at Rolls Royce prices. However, they can afford a Buick. "...A third world doctor with a third world medical education may be the doctor you get under Obamacare." I take it you consider this to be a bad thing. What about a third world doctor with a US education? If, as you seem to imply, third world doctors aren't as competent, the continued growth in the legal profession Peak pointed out, might make sense. I like to go with what works, not what is ideologically pure. Great Britain spends half what we do on medical care, gets roughly the same results. Let us just copy them and be done with it. Free enterprise and medical care are not a good fit. We need death panels to pull the plug on those patients who are both terminally ill and aged. Otherwise, your costs are going to balloon to the moon. A private-sector solution might be health insurance for elderly that reads, "When the doctors and insurer decide that further medical treatment is unwarranted, they have the right to cease coverage immediately. All disputes must be resolved by binding arbitration by an organization of the insurers' choosing." There won't be more docs. They'll just take more patients per hour. Your doc will have his/her hand on the doorknob itching to get out of your examing room. Yes I do believe that, on average, third world doctors are not as competent as American doctors. Here is some background. The examples are from India because the material is in English not because they are unique. Any American educator who feels harried by student protests might consider the state of learning at some schools in India. When a proctor at Satna College in Madhya Pradesh complained that students were copying examination answers from their textbooks, the students staged a minor riot. At Mainpuri a proctor who caught students cribbing was hacked to death with knives. In Gorakhpur, a high school student brought his homicidal Alsatian dog to bare his fangs at any teacher who tried to interfere with his right to cheat. Cheating, of course, is not much of an issue on U.S. campuses these days. With all the student unrest and closed-down universities, there are far fewer exams available for the taking. Rote Learning: People perceive rote learning as being educated which is clearly not true. The emphasis has never been on understanding, gaining the "real knowledge". If someone can mug it up and vomit it out in the examinations he is considered intelligent else of "no-use". Education's should be aimed at imparting knowledge. Marks: All the studies done are just for the sake of the marks, Is getting marks the only motto of studies? Too Theoretic: Subject like Science was not invented on papers, but in India it's all about theory! In school we have 8-10 theory periods compared to only 2 practical periods per week! Is this what science is? Certainly not! The great Indian Coaching Culture: Coaching centers have bloomed in India in past few years as a major source of business ! Particularly because 75% of students want to become engineer/doctor by will or by force. Coaching centers make big sum of money, make a student's life hell ! I feel entrance should be based on project work (original) done by student, his level of thinking, knowledge. If third world doctors are as good as Americans where are the medical breakthroughs they developed? If third world computer programmers are as good as ours where are the killer applications developed in the third world by third world programmers? As for third world doctors with a US education why is such a limited resource as a seat in medical school going to a foreigner? I guess we can swap opinion pieces and news articles, if you'd like. The links below tell a different story than your examples, including one about inovation. But, as they are just news articles, as yours are, I wouldn't use them as serious support for a point I was trying to make. I'm not arguing that Indian doctors are as good or better than US doctors, you understand, but neither have you shown that they are less competent. Do you have anything more substantial to indicate Indian doctors - or any other foreign born doctors - are inferior? You do understand that any doctor must obtain a state license to practice in the US, no matter where they went to school. This requires 2-3 years of US residency, as well as other hoops to jump through. Board certification is also required by most hospitals and health plans. By the way, your Time Mag article is from 1970. You might consider something newer. ""As for third world doctors with a US education why is such a limited resource as a seat in medical school going to a foreigner?" Well, I don't know the answer to your xenophobic question, but you should be aware that availability of medical training is, for the most part, at the whim of the AMA which has a strong interest in protecting current members, as any union or guild does. As a non-AMA certified medical school cannot hope to attract many students, the AMA effectively controls the supply of doctors. So, if seats are limited, it's because they have been made artificially so, for political reasons. There may be plenty of empty seats if implementation of Obamacare continues, as being a physician may lose it's appeal as a viable career, and fewer may be willing to spend the tremendous amounts of time and money required. We might find, in the future, that we're thrilled to find ANY doctor to treat us. Where does this fairy tale come from pseudo benny? Your use of the term Obamacare immediately makes your article seem prejudice. I would just as easily blame the insurance industry, or the pharmaceutical industry. By Obamacare what exactly do you mean? That everyone would actually have health care? Why don't you quote the number of Americans who are going overseas to get treatment? From doctors and hospitals as good as or better than here. How come a doctor in Canada thinks of himself just like any other professional, and vacations in the same places as any middle class professional, and is totally fine. Your 2 degrees seem like they really didn't teach you much about using logic rather than prejudice to explain your point of view. The Concierge Medicine Research Collective is a research and data depository created by Concierge Medicine Today. It has data-mined and, more importantly, 'verified' hundreds of concierge healthcare practices across the U.S. Our research over the past few years tells us that there are approximately 1,312 verifiable physicians practicing in a concierge medicine practice model across the U.S. We believe there may be a significant number of additional physicians practicing that are yet to be identified. An additional 815 number of verified physicians operate cash practices. NOTE: This number accounts for only internal medicine/primary care and family medicine physicians. An interesting point about these numbers is that approximately 66% of them are internal medicine concierge medical practices. The remaining 34% are family practice concierge physicians. We are beginning to see concierge medicine business or practice models open up in dermatology; dental; cardiology; and nephrology as well as other specialties. Also, a very small but increasing number of concierge pediatrics practices are opening as well. It's important to add that there has been a significant amount of estimated numbers of concierge physicians given to the media over the past few years. Some are exaggerated and others much too low, as reported in the MedPAC (Medicare Payment Advisory Commission) Report in September 2010 by the National Opinion Research Center (NORC) at the University of Chicago and Georgetown University. They were only able to identify 756 physicians across the U.S. who have entered into what they termed retainer-based arrangements, commonly called "boutique" or "concierge" medicine. At the time of their study we believe there were well over 900-1,200 concierge physicians practicing nationally. Medicare, Insurance, Healthcare Reform and Concierge Medicine. The Collective does concur with the statements made last September by NORC's Elizabeth Hargrave, who presented a study on concierge medicine to MedPAC during a Sept. 13 briefing in Washington, D.C. She stated that very few Medicare beneficiaries will be affected in the future by these practices. According to The Collective’s research from October 2009 to January 2011, approximately 80% of primary care/family concierge medicine practices accept Medicare beneficiaries as well as most insurance. Barring unforeseen cuts in reimbursement, we anticipate the majority of these doctors will continue to participate in Medicare. "Where does this fairy tale come from pseudo benny?" Benji is covered, as he used the word "roughly". He is using it here to mean 'order of magnitude'. Wow! You've certainly slain a lot of strawmen in your short comment, but you are correct that the term "Obamacare" when used as a nickname for "the Patient Protection and Affordable Care Act" carries a negative connotation. I can only say that Obamacare is much easier to say, and doesn't cause people to laugh when they hear it, due to its incongruity. I suppose the term is a shortening of the phrase "Obama's health care plan"; a monstrosity like none seen in recent history, which has been rammed down our throats by Obama and the progressives in Congress, even though 2/3 of us are opposed to it. What little I know about you allows me to guess that you may hold certain views in common with others who sometimes use predujudicial labels to describe people or things they don't like. Let me ask you this: have you ever referred to anyone as a "climate change denier"? Or, perhaps you have used the phrase "spewing pollution" If so, you aren't in a position to criticize descriptors used by others. lol@James. Misinformed and xenophobic to a comedic level. The number of new doctors is pretty much irrelevant. If and when doctors are forced to comply with Obamacare, a huge number of them will RETIRE, no matter how old they are. Huge numbers have already said so. Culinary Choice and Freedom: Keep Food Legal! Food Truck Fiesta at Farragut Square in D.C.